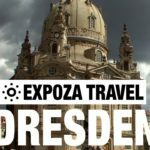 Travel video about destination Dresden. Dresden is the capital of the German Free State of Saxony and a major centre of culture with a remarkable history. Although almost completely destroyed at the end of the Second World War and for many years hidden behind the Iron Curtain, today the city shines out in all of its former splendour. As a centre of art and science, Dresden Castle contains a number of collections that are well known throughout the world and draw international visitors to this most ambitiously-conceived and successful project. Close by, the stable courtyard is the world’s oldest original Tournament Arena of its kind. The Tuscan-arched arcades originated in the Renaissance period and were used by spectators during various tournaments and entertainments. Count Brühl, a follower of Friedrich August The Second, was presented with the Elb Wall as a gift and had a mile-long walkway built for the nobility. It is known as The Balcony of Europe and is located ten metres above the banks of the River Elbe. Meissen is well known for the porcelain of the same name. In the Meissen factory each aspect of the manufacturing process can be observed, along with a presentation of the history of the famous porcelain. The centuries created such beauty that Dresden has been described as The Venice Of The East and Florence On The Elb. Today, the city is a harmony of both architecture and landscape, a brilliant work of art!